Have you heard of walking tacos? They're a cool new food concept where traditional taco ingredients are served in a handy, portable form so they can be enjoyed on the go. 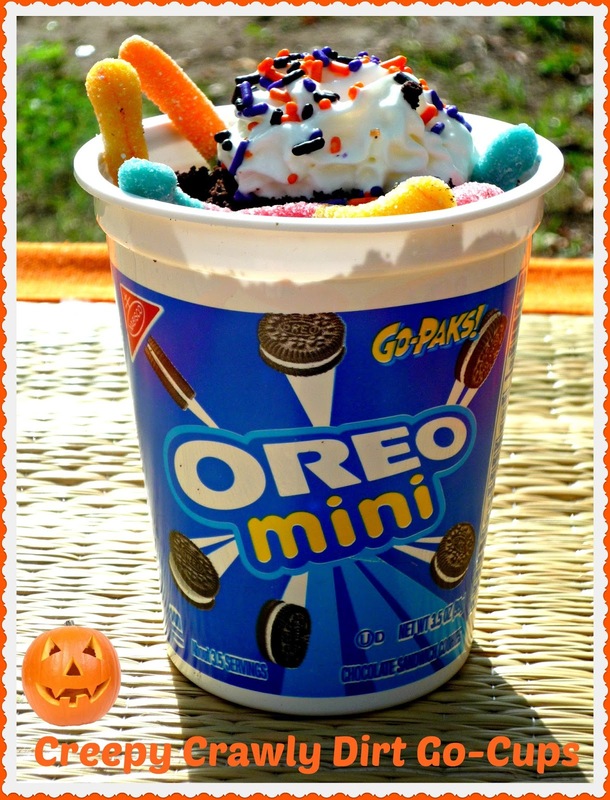 Just in time for Halloween, this fun trend can also be used to make seasonal sweet treats using NABISCO Go-Paks! The cups are plastic, so they won't leak. They're also filled about halfway with product -- making it super easy to add fun and tasty ingredients to the container! Economical Go-Paks! are perfect to purchase in large quantities for Halloween parties -- they're available at Walmart for only $1! 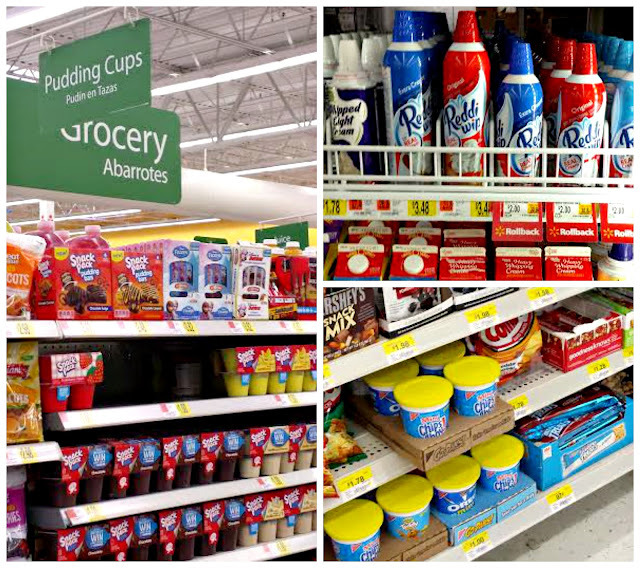 In fact, all of the products needed to make my Creepy Crawly Dirt Go-Cups are easily located at your local Walmart. The Go-Paks! in my location were placed on shelves of snacks at the checkout registers, the Snack Pack Pudding is part of a large shelf display, and the Reddi-wip is in the refrigerated section -- near the milk. Versatile Go-Paks! and Snack Pack Puddings come in a wide variety of flavors, allowing creative cooks to add tasty extras to create a multitude of fun flavor combinations. You're only limited by where your taste buds and your imagination can take you! For my Creepy Crawly Dirt Cups, I combined OREO Mini Go-Paks!, Chocolate Fudge Snack Pack Pudding, colorful blood-red strawberry jam, Reddi-wip, sour gummy worms, and fun Halloween sprinkles. The OREOS are chopped and layered with the fudgy pudding and blood-red strawberry jam. 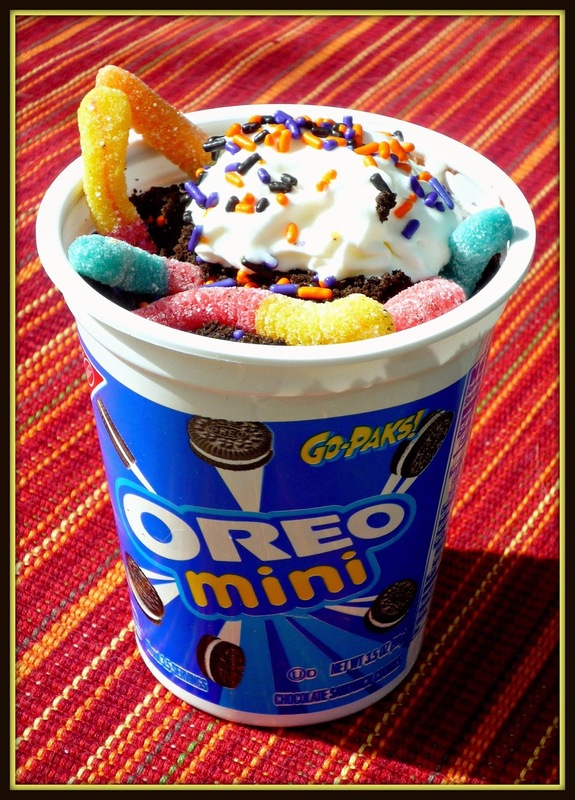 The cups are topped with crushed OREO "dirt." For decoration, I used creepy crawly sour gummy worms, a generous dollop of Reddi-wip, and a sprinkling of colorful Halloween jimmies. These handy sweet go-cups are all treat...and no trick! Wait until you see how easy and fun it is to whip up these fun treats! 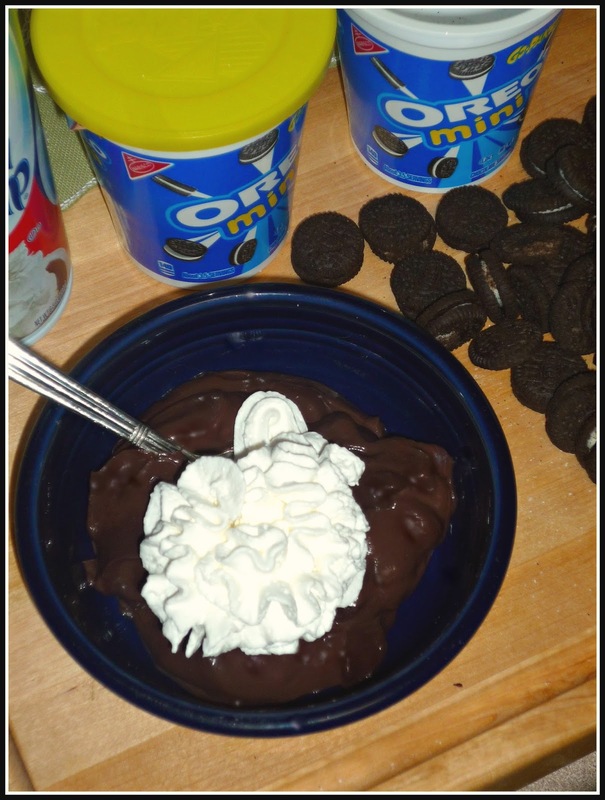 Step 1: Add the pudding from the Snack Pack Pudding Cups to a bowl. Add 1/2 cup of Reddi-wip to the pudding and stir well to completely combine. Reserve 10 OREO minis from each of the Go-Paks! and set aside. Chop the remaining OREOS into quarters with a sharp knife. Step 2: Place the strawberry jam in a small bowl and add 3 drops of the red food coloring, then stir until completely incorporated and the jam is a blood-red color. Layer the following ingredients into each empty Go-Pak! 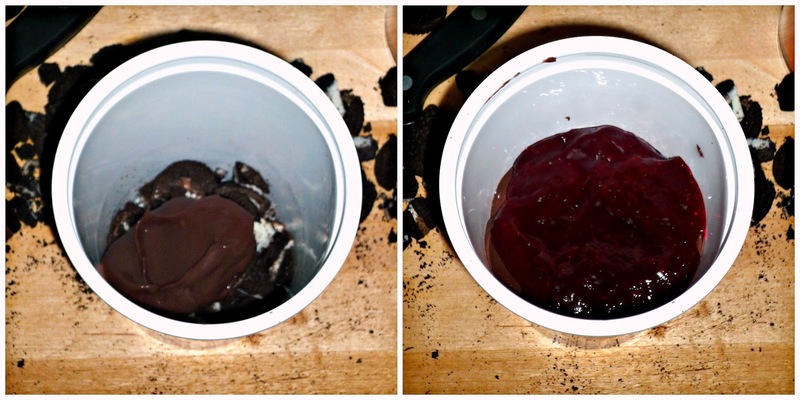 One-fourth of the OREO minis, one-fourth of the pudding, and half of the strawberry jam. 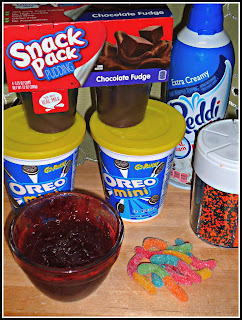 Step 3: Add a second layer of chopped OREOS on top of the jam, then add a second layer of the pudding mixture. Place the reserved OREO minis in a zip-top bag and crush with a rolling pin or heavy glass -- until they're finely crushed and look like dirt. Add half of the crushed OREOS to the top of each cup. 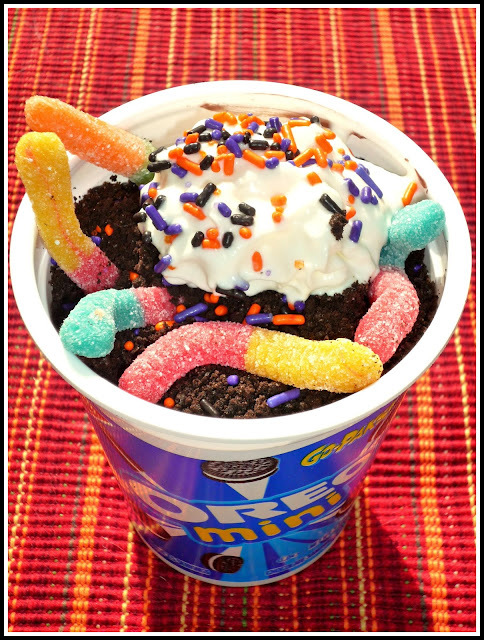 Decorate each dirt cup with half of the sour gummy worms, Reddi-wip, and colorful Halloween sprinkles. Serve immediately or refrigerate for 2-3 hours if you prefer your parfait chilled. These fun Creepy Crawly Dirt Go Cups are super fun to make -- they're as fun to look at as the are to eat! They're super fudgy, and it's so much fun to dig into the cup through all the different layers. The blood-red jam in the middle is a creepy Halloween surprise. 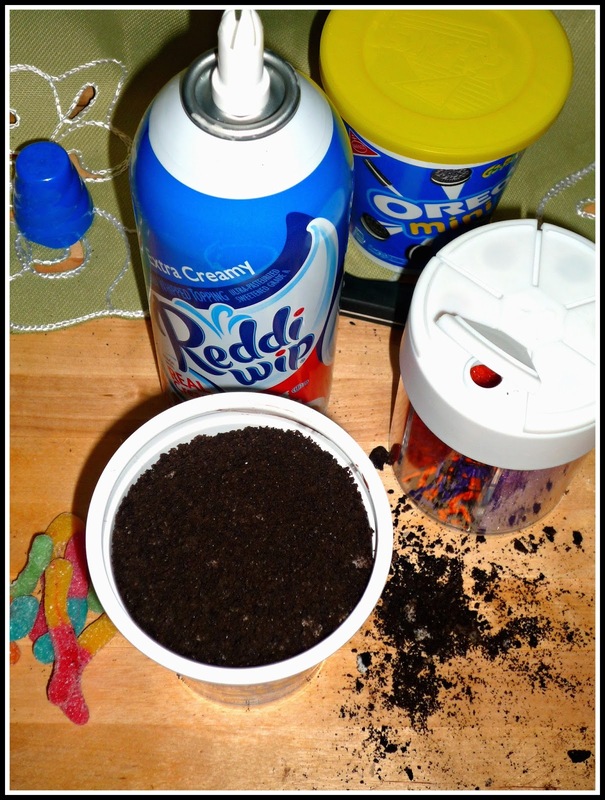 These sweet go-cups are a fun afternoon project to enjoy with young kids -- they'll have a blast adding the gummy worms to the OREO "dirt" that tops each cup. That said, big kids are sure to like them too! I hope you'll take time to check out more delicious Go-Pak! recipes -- I'd love to hear about your favorite combos.